Have you ever tried to be ind to someone or to treat them like an ing? Does your house have an itchen and do people need to nock before they enter? Have you ever seen a football player run back an ickoff for a touchdown or a boxer ock-out his opponent with a single punch? 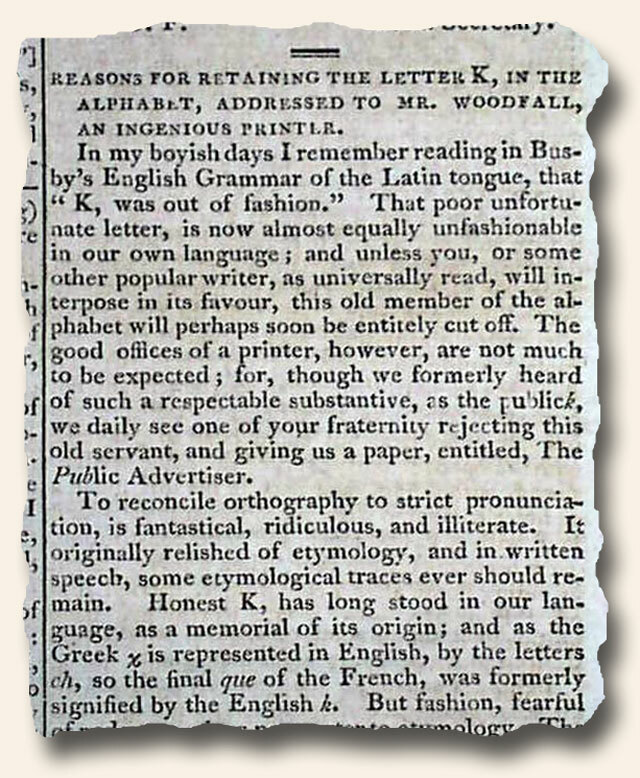 Thanks to the impassioned early 19th century arguments in defense of keeping the letter “K” in our alphabet, the answer to all the above is an emphatic “no”. Of course we are left with the tension created by “know” vs. “no” and “knew” vs. “new”, but such stressors are a small price to pay for being able to get down on one knee to propose or to greet a loved one with a kiss. I for one are sure glad we ept it! The complete article may be read at: The Port Folio, May 23, 1801.